Dynamic signaling responses to changing directional cues: Cdc42 signaling activity is monitored as the direction of a chemoattractant gradient is switched. 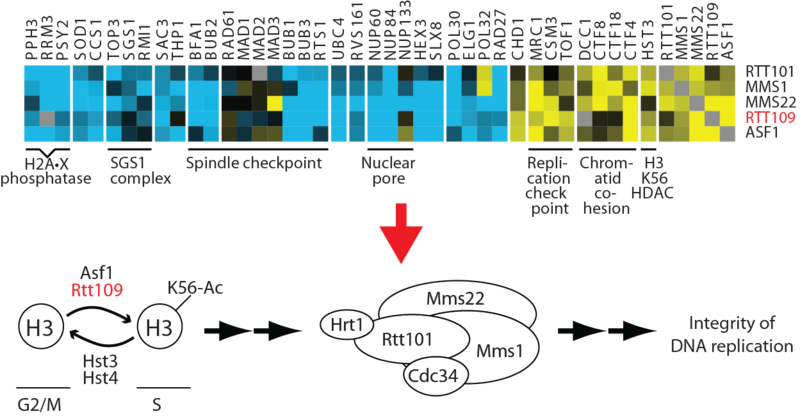 Genetic interaction maps: quantitative genetic interaction patterns were used to identify new components and connections in the yeast histone H3 K56 acetylation pathway. We are extending these strategies to study signal transduction in mammalian cells. Analysis of signaling activities in space and time: a psuedocolored image of the activity of Cdc42 in a moving leukocyte is shown. The cell periphery was parametrized into small windows to compare local Cdc42 activity with cell edge protrusion dynamics. 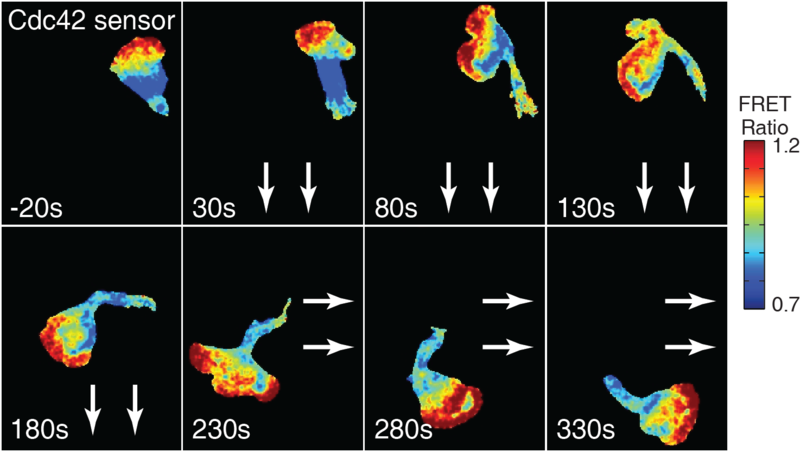 Automated analysis of chemotaxis: we use automated uncaging of chemoattractants and live-cell imaging to measure dynamic chemotactic responses under standardized conditions. 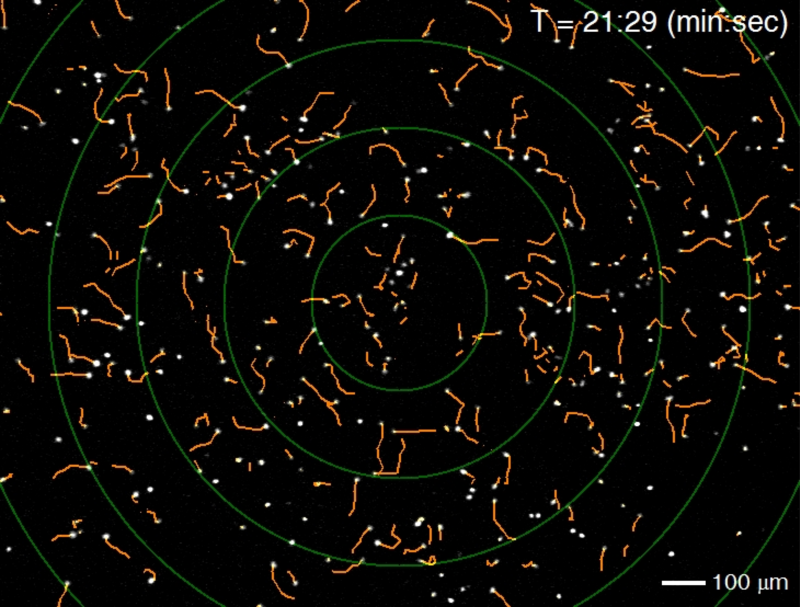 Shown are the tracks of differentiated PLB-985 leukocytes responding to a radial attractant gradient. –Briana Rocha-Gregg was awarded an NIH Ruth Kirschstein National Research Service Award! –Stefan Lundgren was selected as a Trainee in the NIH Training Program in Molecular and Cell Biology! –Briana Rocha-Gregg received a competitive Public Engagement Grant from ASCB and the Simons Foundation for her work in the Young Scientist Program! Way to go Collins Lab! We are pleased to welcome two new graduate students from the Biochemistry, Molecular, Cell & Developmental Biology Graduate Group: Emel Akdogan & Stefan Lundgren! Maya Mysore, a visiting high-school student scientist was selected as a Regeneron Science Talent Scholar for the 2018. Maya has been working with graduate student, Briana Gregg on a project aimed at investigating CDC42 activity at the single-cell level in neutrophil-like PLB985 cells. Way to go, Maya! Dr. Sean Collins was awarded a New Innovator award from the National Institute of Health! Read more about the award HERE.